When one thinks about the future of business innovation and technological development, one place comes to mind: Silicon Valley. But thanks to a group of academically motivated economics and business students, that place might soon be Washington, DC. Students from AU's Washington Semester and Graduate Gateway Programs had the opportunity of a lifetime when they garnered the attention of the DC Chamber of Commerce. The students presented a semester-long research project that took them to 17 different start-ups such as Google and Intel in Silicon Valley, and explored the possibilities of growing the entrepreneurial and innovative future of the DMV area. Their research, which mapped over two hundred local start-up firms, measured Washington, DC against six major U.S. innovation and entrepreneurial hubs. With research based on important factors such as establishment dynamics, patents, venture funding, STEM talent and migration, business costs, housing, and gender diversity, the students were able to present the Chamber of Commerce with several useful and ingenious recommendations. "It was a once in a lifetime opportunity that I will never forget", said Micaela Coleman, global business student in the Graduate Gateway program. "This class literally changed my life and I'm currently taking what I learned and the connections I made to prepare for my future as an entrepreneur." The group of students traveled to Silicon Valley under the guidance of Nimai M. Mehta, Academic Director of the Global Economics and Business Concentration in the Washington Semester Program. Mehta, who is currently working on a pilot project on improving sanitation and education for girls in India, concentrated on comparative economic systems, public-choice, and development for his doctorate studies. "By taking advantage of the Silicon Valley start-up network," Mehta said, "they gained important research and analytical skills along with industry specific knowledge that can be employed widely, for both future business and policy research." Once in a lifetime opportunities like this come frequently for students in AU's School of Professional &Extended Studies (SPExS). 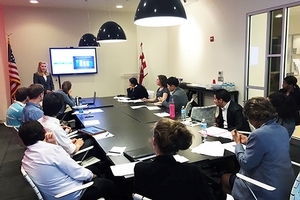 With nearly 70 years of experiential learning and concentrated coursework under their belt, SPExS programs attract students looking to study and engage with one of D.C.'s many political, government, media, and international organizations. By immersing themselves in the culture of the nation's capital, Washington Semester and Graduate Gateway Program students have the opportunity to gain a competitive edge in future professional endeavors, while at the same time completing relevant coursework and gaining school credit. "For me, it was an eye-opening experience that you can't find elsewhere." Washington Semester student Ali Mohamed said. "Instead of just reading about the Silicon Valley, we got to see it firsthand. I bet that a student in a classical classroom will not be able to come up with valuable findings and insights like those of a SPExS student who went on this trip." Presenting for and meeting the D.C. Chamber of Commerce was not only a once in a lifetime experience for the students alone, however. "Nimai and his students delivered a masterful presentation of their initial results, and I and my staff could not be more impressed", said Harry Wingo, President and CEO of the D.C. Chamber of Commerce. "I could not be happier with this initiative and look forward to what I know will be great developments as we move to the next phase." "The DC Chamber of Commerce presentation was the catalyst that made us ask about every nook and cranny everywhere we went in California." Mohamed said. "We put part of what we had seen or studied in class into practice and, eventually, we became fully cognizant of the factors that made the Silicon Valley what it is today. As novice entrepreneurs, we are in a better position not to know where to start our own start-ups and to advise others where to start theirs as well." Micaela Coleman has taken this opportunity and turned it into a future endeavor as well. She recently accepted an admission offer from the Kogod School of Business at AU to get her MBA. SPExS is currently developing plans for a future tip to Silicon Valley in 2016.